A professionally designed and installed landscape grows in value each year and can add as much as 15% to the value of your property. From plantings to retaining walls, paver patios to landscape lighting, we do it all. We will work with you, suggesting plantings and designs that incorporate your ideas and tastes. Our goal is to formulate a landscape design, within you budget, that will meet your needs, compliment your property and grow in value for years to come. 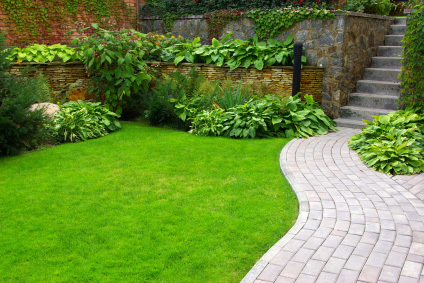 Our Landscape Consultation is best suited for those customers who would like a quote on repairing or replacing some aspect of their existing landscape such as plantings, lawn, retaining walls, etc. The Landscape consultation does not include the preparing of a landscape design. The Landscape Design Package includes a customer interview, the preparing and presenting of an original landscape design and itemized quote, and in many cases a digital image of what your landscape could look like. Our professionals will use only the finest materials available. All plantings will be selected from prime nursery stock. Our hardscape materials are supplied and produced by reputable companies known for the quality of their products. From the initial design to the finished landscape, we employ a trained staff of personnel with a high level of expertise to assure the project is completed to your satisfaction.